Remember the scene in Rise of Cobra when Duke climbed the sheer face of a glass skyscraper with a giant yellow suction up, shot through the plate glass window and attacked a squad of Neo-Vipers with his samurai sword, all while wearing fabulous Jackson Pollock camo pants? No? Maybe I remembered wrong, and it was just part of the GI Joe Expanded Universe. Hey, if Star Wars can have a Mon Calamari jedi, GI Joe can have a katana and suction cup wielding Duke. 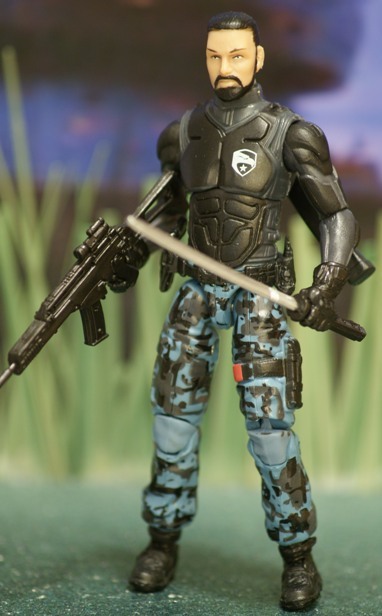 As much as I can’t stand the armored shirts of the 2009 GI Joe movie, I don’t mind this figure. I think it’s because they left off the paint wipe application that was used on the other armored figures. I don’t mind paint wipes, but most of the movie figures’ paint apps looked sloppy. Naturally, the samurai sword and goofy suction cup accessory don’t suit Duke. But they do fit perfectly for one GI Joe team member. That’s why I popped off the head of a Clutch figure to create a quick-and-dirty custom. Brawl on, Big Brawler. I much rather would have seen him in the movie than a lunkhead like Sgt. Stone. I’ve seen people use this figure as the base for a 25th/ROC-style Widescope figure.